How much does it cost to travel to Galicia? How much money will you need in Galicia? €58 ($65) is the average daily price for traveling in Galicia. The average price of food for one day is €18 ($20). The average price of a hotel for a couple is €52 ($58). Additional pricing is in the table below. These average travel prices have been collected from other travelers to help you plan your own travel budget. Located in the lush green corner of northwestern Spain, the region of Galicia is best known for its seafood and the Cathedral of Santiago de Compostela located in the capital city. With an extensive Atlantic coastline, the climate of Galicia is often damp, though there are a number of rugged beaches that are frequented during the summer season. Other highlights include a culture that traces back to Celtic tribes and unique architecture from ancient standing stones to elaborate cathedrals. The Cathedral of Santiago de Compostela: A 12th century cathedral that marks the culmination of the Way of Saint James Pilgrimage route, located in the capital city of the region. Tower of Hercules: The oldest Roman lighthouse still in use today, located in A Coruna. An UNESCO World Heritage Site. Roman Walls: Located in Lugo, these ancient walls form a 2 kilometer loop around the old city complete with 71 watchtowers. Designated an UNESCO World Heritage Site. Cape Finisterre: Translating to "Land's End," this was once thought to be the westernmost point of Europe. There are many beautiful trails here overlooking the Atlantic as well as the Cascada do Ezaro, the only waterfall in Europe to give into the open ocean. Playa de las Catedrales: One of Galicia's most impressive beaches, the "Beach of Cathedrals" is located near Ribadeo and displays a unique collection of rock formations, arches, grottos, and natural passageways only accessible at low tide. Cies Islands: Only reachable by ferry, the Cies Islands are a hidden getaway just off the coast of Vigo. They are part of a natural bird reserve and have great opportunities for hiking, camping, snorkeling and beaches. 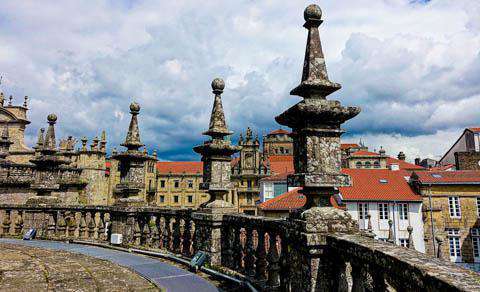 The capital and probably the most visited city of the region is Santiago de Compostela. In addition to marking the final destination of the Way of Saint James pilgrimage, Santiago's public squares and narrow streets represent preserved examples another time and place firmly rooted in faith. Old town especially, with its cobbled streets and terra cotta roofs glow with an old world charm. The city is very navigable on foot with many shops, tapas bars, and bustling crowds. The cathedral, of course, is the centerpiece, its baroque façade of Galician granite dating back to the 12th century. Other notable towns and cities include A Coruna which is known for its Roman lighthouse, Lugo known for its Roman walls, Pontevedra which has a number of architectural gems, and Galicia's largest city, Vigo. Galicia is a region full of opportunity to engage in just about any kind of activity. Historic sightseeing will unveil a range of Roman landmarks, elaborate cathedrals, churches, cobbled streets, and marketswhile a walk into nature, especially along the coast, will show an assortment of outdoor beauty including unique rock formations, sweeping cliffs, ocean views, and rugged coastline. Some of these areas have beaches that are prime destinations for swimming and snorkeling, as well as boating to islands just offshore. Villages and cities will offer chances to engage in the local culture, sampling the sights and flavors of northwest Spain. You might even come across a festival of the region, like the Galician Entroido-a celebration dating back to pre-Christian times. Since Galicia is a world fishing power, it is definitely the place to go if you enjoy fresh fish and seafood. In fact, almost half of the world's mussels are sourced from the region. The Spanish word for seafood is "marisco," and fresh catches include things like clams, mussels, pod razors, cockles, crabs, barnacles, crayfish, snails, lobster, squid, sea bass, hake, scorpion fish, anchovies, sardines, and tuna. Pulpo a feira is a common seafood dish of octopus prepared with oil, salt, and hot paprika. Then there are empanadaspies made with a traditional dough, filled with onion, pepper, and some meat, usually tuna, veal, or seafood. A specialty of Galicia is a type of stew called Caldo Galego, which is simple but satisfying for warding off the damp chill of the region's climate. For dessert churros are common throughout Galicia, while tarta de Santiago (cake of Saint James) is a ground almond cake marked with a Galician Cross that can only be found in Santiago de Compostela. Wine is the main drink, the favorite being Albarino. By air to Galicia, there are three international airports: A Coruna, Vigo, and Santiago de Compostela. Santiago de Compostela is the main airport for the area and connects Galicia with a number of European cities, including London, Dublin, Frankfurt, Liverpool, and Rome. By car, there are plenty of motorways connecting Galicia with the rest of Spain and Portugal. By train, there are also routes from Portugal and cities in Spain (via the RENFE rail company). If you wish to take a ferry from the UK, the best route is to come into Santander located on Spain's northern coast in the Cantabria region.